An important aspect of the service support provided by GMS Composites is solving engineering and design problems, and then supplying customers with fabricated components that meet the application’s requirements. We can assist in design and engineering components for most industries including: marine, automotive, aeronautical, general engineering and construction. To ensure optimum design and performance, prototype parts and new designs are developed by experienced engineers using 3D CAD and full Finite Element Analysis (FEA) software. Moulded parts can be supplied fully finished, trimmed and polished as needed. CNC machining, trimming, drilling, cutting and sanding fibre of reinforced (FRP) laminated sheets and tooling boards according to customers’ specifications, tolerances and drawings is a core service. For over 8 (?) 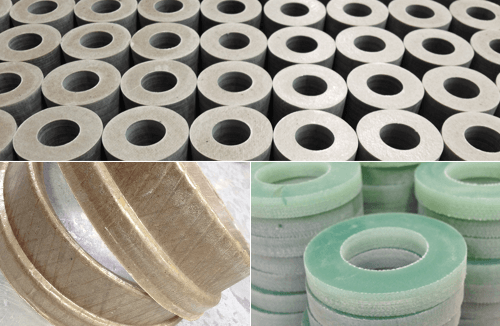 years, GMS Composites has been supplying to order high quality finished machined FRP finished parts such panels, gaskets, and washers to a variety of demanding industries. Modern CNC machining facilities are installed, which are fully programmable from dxf or similar CAD files. The installed CNC routers can accurately cut complex shapes and machine FRP composite parts with dimensions up to 1000mm wide by 2400mm long by 100mm deep. GMS Composites can also ‘manufacture to order’ custom designed composite laminate sheets based on epoxy resin, which can be reinforced with a wide choice of glass, carbon or other fibres, technical fabrics and cores as needed for an application. Press moulding and compression moulding machines with a range of capabilities are installed in the GMS Composites production facilities. This provides customers with flexibility to specify a wide range of moulded epoxy sheet laminate structures, including cored sandwich panel designs. Press moulded epoxy FRP sheets / cored sandwich panels - sheet dimensions up to a maximum of: 1000mm wide x 1000mm long x thickness ranges from 0.5mm up to 80mm. Compression moulded epoxy FRP parts – sheet dimensions up to maximum of: 500mm long x 500mm wide x 200mm deep. All GMS Composites standard and bespoke manufactured prepreg products are researched and developed in-house.